The Princess Elizabeth is slated to marry Prince Ronald when a dragon attacks the castle and kidnaps Ronald. 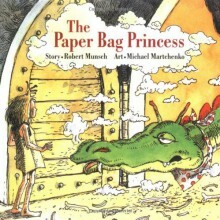 In resourceful and humorous fashion, Elizabeth finds the dragon, outsmarts him, and rescues Ronald --- who is less than pleased at her un-princess-like appearance. Full color throughout. http://crodger1.booklikes.com Miss Rodgers' Riveting Reads 5.0 The most intelligent princess of them all! text The most intelligent princess of them all! A cool story with a likeable main character and a great ending.I have wanted to read this book for such a long time and finally got a copy. I'm so glad I did. This is a simple, but amazing children's book. Highly recommend to children and adults alike, male and female.